Neha Dhupia is all set to host sister duo Janhvi and Khushi Kapoor in an upcoming episode of BFFs With Vogue. Pictures of Janhvi and Khushi, looking uber-glam, from the sets of the show have taken over the Internet. 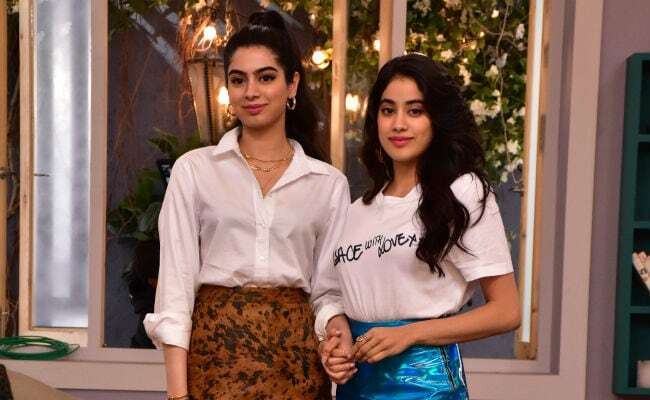 For Janhvi, who debuted in Bollywood with 2018 film Dhadak, it may be another talk show (remember, she’s also appeared on Koffee With Karan?) but it’ll be Khushi’s first full-fledged public appearance. Not much is known about Khushi’s plans about joining Bollywood. Janhvi looked chic in a Versace tee paired with a Madison skirt. Khushi Also scores high on our fashion-metre.